aculeatus) at the Grant Museum of Zoology. 1) The echidna is a special sort of creature for the unequivocally rare party trick (amongst mammals) of laying eggs (clearly not rare overall in the animal kingdom) rather than giving birth to live young. These sorts of super unique mammals are called Monotremes. There are only five species of egg laying mammal in the entire (modern) world. These are split into two major groups; the platypus (of which there is one lone species, awww) and the echidna. 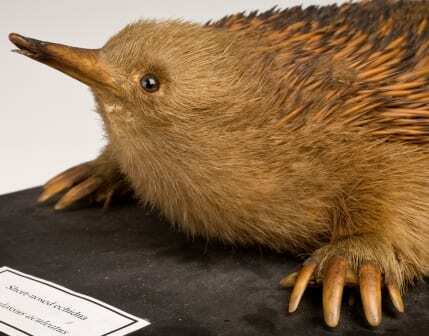 There are at least four species of echidna: the short-nosed, the eastern long-nosed, the western long-nosed and the Attenborough’s long-nosed (also called the Sir David’s long-nosed. No points for guessing who it is named after). 2) Our featured mammalian egg-layer is of the short-nosed variety. The scientific name for this species is Tachyglossus aculeatus which means ‘quick tongue’. (Stop it). 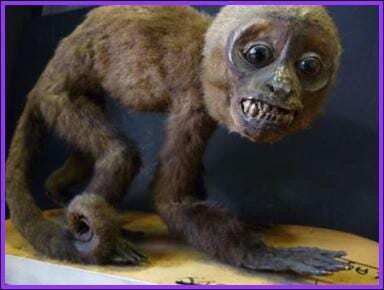 It was named in 1792 by a natural historian called Shaw. 3) The echidna’s spines are made of keratin (like your finger nails and… rhino horn for example) and are longer than the fur beneath so that they protrude. The spines form an obvious defense mechanism from passing predators. 4) All five species of monotreme (or every egg laying mammal naturally occurring in the wild, if you like) are to be found in either Australia, New Guinea, or on a number of the neighbouring small islands. 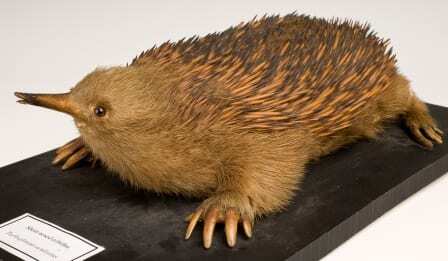 The short-nosed echidna is the only echidna species to inhabit mainland Australia however. long-nosed echidna to appreciate the difference). 5) The short nosed echidna (which is also known as the short-beaked echidna, common echidna, and the spiny ant eater, just FYI) inhabits areas that are covered in forest, rocky areas or sandy plains. They feed, as you may have guessed from the previous bracketed tangent) on ants and termites. Oh and grubs… so really it should be known as the spiny-ant-termite-grub-and-probably-other-invertebrates-as-well-eater. 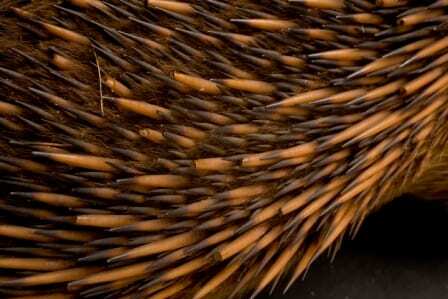 Echidnas rely on their long sticky tongues to catch their prey and are entirely lacking in teeth.